The last two months have gone so quickly. 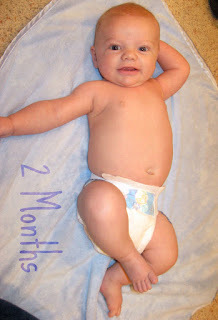 I can't believe that Garrett is already 2 months old. On November 2 we had him in to the Doctor for his regular check-up. Not much of a surprise that he weighed 14lbs, 6ozs and was 23 1/2 inches long. We've had to do a closet cleaning already to get rid of the little stuff! We couldn't be happier having this little guy around, our lives are changed forever by him. He is a great baby! 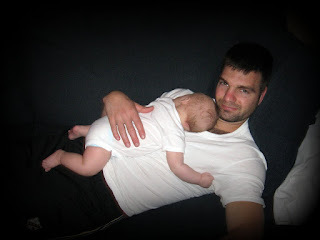 Sure he doesn't sleep through the night yet but he does go to bed by 9:00 pm usually and makes it a solid 6 hours, eats quickly and goes right back down for a few more hours of sleep. He is so content and happy, in all seriousness we rarely hear him cry. He loves hanging out in his bouncy and his bumbo seat...not sure he's crazy about how much his sister bugs him but he has such a laid back personality that it rarely seems to phase him. 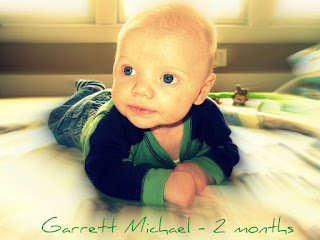 Garrett gives tons of smiles that melt my heart and hearing his little voice coo and almost giggle makes me smile. We certainly feel blessed to have a happy, healthy baby! whoa look at that scruff!! Getting ready for deer camp I see! It's no longer scruff, it's a full beard! I like the scruff look but this has got to go :-). He says he just too lazy to shave, nice. He promised when he got back from Drummond he'd shave it.